Ah, the sound of palm trees rustling in the wind, the feeling of the hot sun coming through your vehicle sunroof, and the sight of a Hampton City police officer sitting at the side of the highway on a lawn chair with a radar gun aimed right at your front grill! And you might be thinking, nah, he’ll get the guy ahead of me. Wishful thinking. He’s collecting speed data from every car that passes by in an assembly line fashion. Where’s this highway you might want to detour around for your Sunday drive? It sits about one mile outside of Hampton, FL (almost smack dab in the middle of the state) and is about 1260 miles long. Okay, there’s nothing really illegal about catching a speeding car. If you speed, you should get a ticket. But imagine all the money rolling in to the city from every single speeding ticket from every single car lucky enough to travel that stretch of highway day in and day out? The question is, where does all that money go? You would think it would go towards building up the town – updating the library, supplies for the school, new playground for the local park, less tax for the residents? On the contrary. The wealthier residents moved out years ago, and the current residents live in ramshackle homes with sagging roofs. The yards are junk filled with overgrown vegetation, and Welcome signs have been replaced with No Trespassing. The money goes towards creating one of the most corrupt towns in America, located in, some would argue, one of the most corrupt states in America. How on earth does this happen? These speeding tickets became such a cash cow for the city (serve and collect), it’s no wonder some of the money went missing. With misuse of public (and some unlucky tourist) funds, and lack of oversight, the city is now the center of attention in what is a bid to erase it off the map entirely. A state audit of the city’s books has been released and it reads like Gangster novel. Thirty one findings ranging from inadequately maintained and safeguarded public records, lack of policies and procedures around city-owned vehicles and cell phones, to not establishing an audit committee and questionable city official salaries. Residents feel they have nowhere to go to complain about how City Hall is run. If they do complain, their water gets shut off – that’s if there’s any water left after being diverted into buildings with no working meters. Some business haven’t paid a water bill in years. The future prospects for this town are now at the mercy of the Florida Legislature. There’s no such thing as a government, whether municipal, state, or federal, that does not have a little bit of corruption running through its veins. 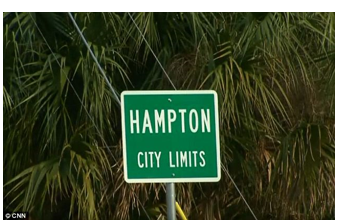 But certainly not to the extent of the City of Hampton. Governments need to implement a strong compliance program that provides an anonymous place to report any wrongdoing, and also provides the ability to investigate and remedy the wrongdoing before it gets out of hand…to the point of potential obliteration from the world map! Whether it’s for regulatory compliance, financial transparency, corporate governance, employee, client, investor or patient relations, becoming WhistleBlower Secured™ will enhance your corporate integrity and empower government employees to contribute to an ethical workplace.